Theatre journalist and critic for over 30 years. London reviewer and feature writer for Glasgow’s The Herald for 12 years and for many other newspapers and magazines, I now review for various theatre websites as well as my own. You can find some on: www.reviewsgate.com; on www.Londongrip.co.uk and on www.theartsdesk.com. Plus audio interviews at TheatreVoice www.theatrevoice.com). I have also recorded interviews for the Rose Bruford Theatre Archive. Books published include The Bloomsbury Theatre Guide with Trevor T Griffiths; a collection of interviews with actresses, Sheer Bloody Magic (Virago) and Faber & Faber’s Pocket Guide to 20th Century Drama with Stephen Unwin. For ten years I was a Visiting Tutor in Journalism at Goldsmiths College and for three years with City University. Prior to all of that I worked with the RSC, National Theatre, Round House and Royal Ballet as a PR and as an administrator for other theatre and dance organisations. I also lived and worked in Montreal and Texas, travelled through south America for six months and worked in Iran for a summer vac, before the fall of the Shah. My story as a theatre reviewer goes back a long way – officially since I started writing reviews as part of the breakaway listings magazine collective, City Limits in the early 1980s. But I think it goes back further than that. Sometimes it can be hard to put your finger on exactly where a passion starts. But theatre going for me started in the early 1960s when as an 18 year old I went to see Vanessa Redgrave in the RSC’s As You Like It at the Aldwych Theatre. Up until then, I’d been a film buff, devouring film annuals as a child and in my teens my first job being with the Rank Film Organisation. But after I saw As You Like It, I got the theatre bug and knew I wanted to work in the theatre, not as an actor but somehow. I landed a job as a Press Assistant in the Press Office at the Aldwych Theatre and the next three years was a heady, influential time with the triumvirate of Peter Hall, Peter Brook and Michel St Denis leading the RSC into what might be termed a golden age. But the best way I can describe what theatre has meant to me is to go back in time to where I came from, madness, The Coppice Hospital, because the madness and theatre have been so inextricably entwined for me. Sometimes I think I’ve been living in Peter Brook’s Marat Sade production all my life. I was brought up in The Coppice, a mental hospital where my father was the Medical Superintendent – a good training ground for a life spent in and around the theatre. You could argue that all theatre is a controlled form of madness – playing with a serious intent; cathartic displacement. Actors, lucky things, get to act out their deepest fears and compulsions whilst the rest of us just go mad watching it. Acting can be a saviour against going mad. Yet the line between madness and theatre is a desperately thin one. Antonin Artaud, the brilliant, troubled French playwright/director who suffered many breakdowns, wanted a theatre that went to the limits, a theatre purged of western obsession with text. `Current theatre is in decline’, he wrote in the 1930s, as he might have said today `because it has lost any feeling for seriousness on the one hand, and on the other, for laughter – and has broken away from Danger.’ He wanted us to feel a kind of frenzy and terror when we were in the theatre. Certainly for very many years, until quite recently, the theatre has offered itself to me as a kind of laboratory, a place for studying human behaviour, at one remove, voyeuristic, but a place of examination from which to learn lessons about how to live life properly. I wanted to learn lessons from it because I wanted to know who I was. Together, theatre and I have gone through many different phases, experienced many different revolutions – political, emotional, cultural, sexual in line with the developments in society from the 1960s onwards. I have been a child of my time; and my theatre reviewing and the judgements I have brought to bear on my work have been born and mediated by that transitional journey. The two photos on this page and the Home page represent two aspects of me. I’m now in my 8th decade. The first is a nice official photo taken for a book published for the Critics Circle Centenary in 2014. 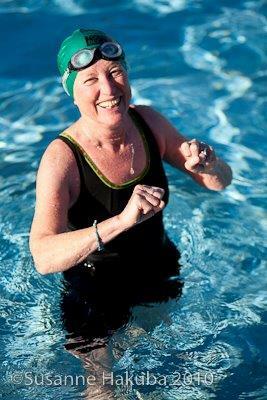 The second picture, taken a few years ago is of the interest that has now become a complementary passion: outdoor swimming. The two complement each other wonderfully – the former offering intellectual stimulation, the latter a physical fusion with nature, outdoors, and most of all, the forging of new friendships. I hope to continue indulging and learning from both for a good few more years yet. Hmm. one year on. February 2016. What a difference a year makes. Less of the swimming this winter, limbs simply not behaving themselves afterwards. But – Nordic walking. Ah, wonderful new introduction to life. 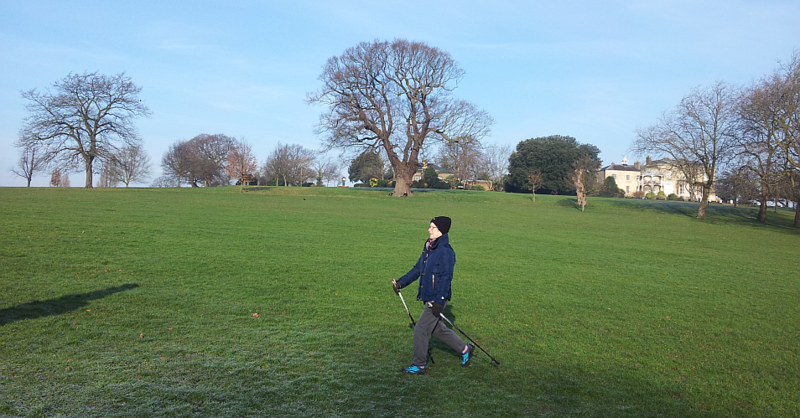 Walking round Ruskin Park and Brockwell and elsewhere with the sticks, adds extra spring to the step, courtesy of the very wonderful Ailien Rhijnsburger (Fit and Happy Outdoors) . And theatre, despite some reservations, continues to lure me. For how much longer? Who knows. Life moves on. I have now more or less retired from full time reviewing, due very much to ill health. I shall add the occasional new review and continue to archive old reviews from my personal computer on to this site when time allows.